Wired intercom system for Road Kings! The most popular intercom systems in the world because it allows riders the ability to incorporate a communication and entertainment system found on the Ultra Classic. 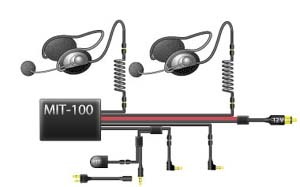 Multiple input sockets allow the addition of peripheral audio sources (music, radar detector, GPS, cellular phone and two-way radio) with auto prioritization. 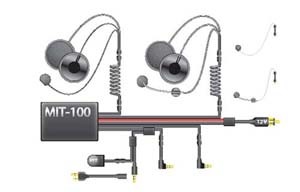 The kit includes everything you need to get set up; including the 12v battery connection kit as well as rider and passenger headsets. 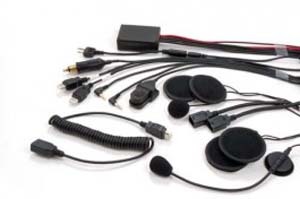 The kit even includes two way radio adapters for most popular radios. Provides outstanding audio quality even at speeds in excess of 100 mph with proper speaker installation. It is also backed by facory two year product replacement warranty. So if you are looking to communicate with multiple bikes as well as your passenger and listen to music or GPS commands, the RKI-100/H will not let you down.